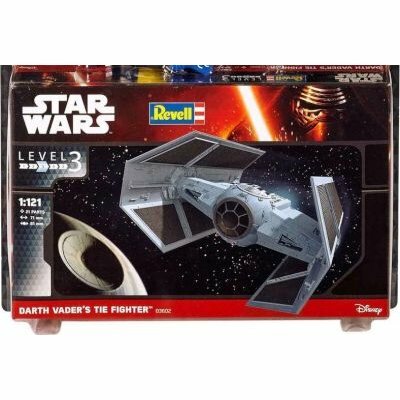 Relive the Battle of Yavin with the Revell Star Wars Darth Vader TIE Fighter Model Kit, with all the components you'll need to piece together the Sith Lord's customised ride. You'll be able to lead the Black Squadron from the front in this iconic starfighter. This model kit is designed for uncomplicated plastic model building enjoyment, ideal for model building fans aged 10 and over. With 21 pieces included in the set, this model gives you finely engraved surfaces, a Darth Vader figure, a replica cockpit and large solar panels. It's also easy to glue and paint, so you'll be able delight in the process of assembling Vader's TIE Fighter. Darth Vader used this customized TIE Fighter in the Battle of Yavin.